From learning music production at one of the top music schools in Poland, to commanding crowds across the globe, to revolutionizing the electronic dance music scene, and now to playing EDC Orlando’s largest crowd yet, Sikdope is one killer DJ/Producer you can’t miss out on. Leading up to his captivating EDC Orlando performance, Sikdope took over The Nocturnal Times socials. 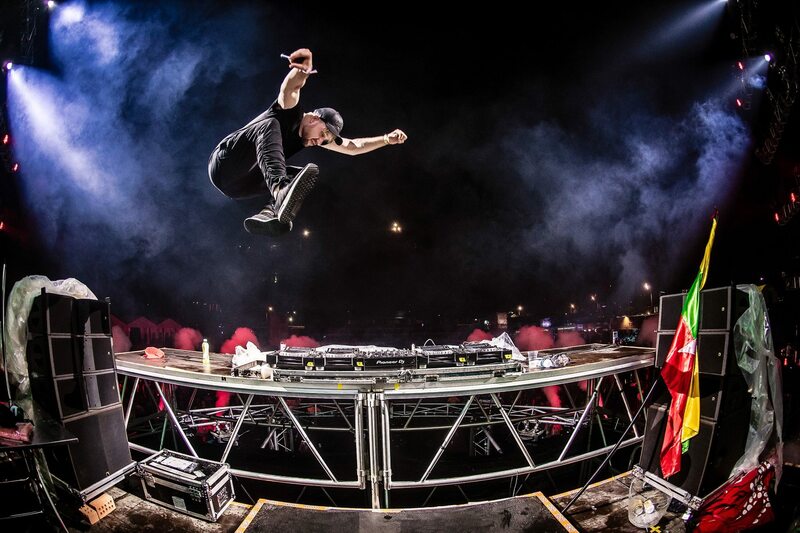 Catching red hot attention by some of the biggest names in the industry like Afrojack, Dillon Francis, Skrillex, Tiësto, Dimitri Vegas & Like Mike, and DJ Snake- just to name a few, Sikdope is on the rise as his vision is to revolutionize the scene with a fusion of numerous genres. By mastering the blend of bass, house, trap and more, Sikdope’s EDC set set the crowd on fire. Taking over circuitGROUNDS Saturday for his first year at EDC, Sikdope stayed true to his word and threw down one of the heaviest sets of the day. Fresh off his recent Corona Electric Beach: Road to EDC 2017 show at rooftop bar AERO in downtown Orlando, Sikdope gave fans more of classic house and dance vibe. Switching it up for EDC, this rockstar producer came to throwdown and followed through by mixing in tracks by none other than Skrillex, Kayzo, Jauz, Adventure Club, Yellow Claw, Martin Garrix, LOUD ABOVT US!, and many more. Sikdope’s own productions slay as much as his remixes do, and the crowd experienced an abundance of both. Tearing up the stage as a perfect opener for later acts like Kaskade, Slander, and Zedd, it’s a guarantee Sikdope not only exceeded his dedicated fan base’s expectations, but picked up endless new fans along the way. Mixing originally epic tracks like Marshmello’s “Alone,” Avicii’s “Good Feeling,” The Chainsmokers feat. Daya “Don’t Let Me Down,” and Skrillex’s “Purple Lamborghini” into filthy remixes, Sikdope carried on relentless energy as the crowd witnessed his spectacular premiere EDC Orlando performance. So what has Sikdope been up to before this showdown at EDC Orlando? For starters, he scored a remix “The Game” on Jauz’ Off The Deep End Volume 1. Cities across the world have hosted this monumental performer, and he’ll close out the end of 2017 traveling to Myanmar, Japan, Canada, Colorado and more. It’s clear that Sikdope’s relentless streak is moving swiftly into 2018 where we can expect a whirlwind of new music and outrageous performances. In between high-energy shows and world traveling, Sikdope will be closing out 2017 with a new single “Crash Over Me” which we can fully expect to rock with heartfelt vocals and a new side to this artist fans haven’t experienced yet. Check out what Sikdope had to say about EDC Orlando’s buzzing excitement, new productions, and how he plans to keep revolutionizing the scene in our exclusive interview below! Nocturnal Times: Thank you for taking over our social media! How does it feel to be at EDC for the first time? Sikdope: It’s amazing I just arrived, I’m kind of slowly starting to feel the vibes and we’re having a good time! The stages are so amazing. Nocturnal Times: You recently just had your Corona Electric Beach: Road to EDC 2017. Was that a sneak peak for fans or can they expect something different for this set? Sikdope: I would say I’m definitely going to play a heavier set at EDC. The rooftop parties are more commercial and vibey so I’m definitely going harder at EDC. I’m going all in! Nocturnal Times: You’ve been learning about producing music since a very young age. How has attending one of the top music schools in Poland been a big influence on your career right now? Sikdope: It’s definitely easier for me to just know melodies for my songs so I would say it was definitely helpful. And the fact that I was playing instruments too, my whole family is musicians. My mother is a music teacher. So it is definitely a family business. Nocturnal Times: You have this revolutionary and versatile sound in all your music. Would you say this set is going to be your big end to 2017 or start to 2018? Sikdope: I’m definitely going to play a little bit of everything tonight because I get really bored after playing 20 minutes of the same stuff, so my sets are always super full of energy. I’ll definitely be playing lots of different genres, not only house. You can expect a little bit of everything. Nocturnal Times: How do club shows compare to playing festivals for you? Sikdope: They are definitely different but I love both. Club shows are much more intimate so most of the times you have only your fans at the club shows, but at festivals there are so many people that haven’t heard about you before. So you have a chance to expose yourself to a different audience and I love that. Nocturnal Times: You’ve been working with Jauz. You have a remix to his Off The Deep End Compilation, tell us about it. What are you most excited about for it? Sikdope: It actually came out today! So if you guys have the time just check out my remix- it’s crazy fast and a different vibe than I’m used to so check it out! Nocturnal Times: Who are some of your musical influences? Sikdope: I’m a huge Mello head! I love Mello music. It’s funny because I’m not even trying to listen to any of the electronic stuff when I’m traveling so I would say each genre inspires me too, not just one particular genre. Nocturnal Times: One day do you picture yourself fusing different genres into your music? Sikdope: Definitely! There are some people that I’m trying to mix on the live music and it’s definitely going to work. Nocturnal Times: Have you had one or two artists that are your favorite to work with? What are some memorable moments with artists? Sikdope: The whole Red Light Family which is Jauz, Mellow, Slushii, Ookay, and Ghastly. We just try and stay together, I’m super inspired by what those guys do so definitely them. There’s this super duo from Poland called LOUD ABOVT US! and they’re doing crazy bass house stuff. They’re so underrated and I’m trying to support them. I’m really trying to support unknown artists. Nocturnal Times: What kind of music can we expect from you in the last months of 2017? Sikdope: I have a new single coming out on November 27th called “Crash Over Me.” It has amazing vocals and it’s kind of not what people expect from me because usually I don’t do songs with huge vocals on it but this time it’s a perfectly beautiful vocal. You guys are going to love it. And probably one more single by the end of the year. Thank you guys so much, it was a pleasure!